► GIFT A TOY THAT IS FUN AND EDUCATIONAL. We believe in making toys that are both fun and educational. This 93-piece gift idea set will help kids build fine motor skills, hand-eye coordination and enhance creativity while keeping them entertained for hours! Which means more time for mom and dad! Supports logical thinking and problem solving, unleashing your child's imagination to endless possibilities. ► HELP YOUR CHILD BUILD SOCIAL SKILLS AT AN EARLY AGE . Social development, teamwork and collaboration are critical to success in today's world. ETI Toys® Engineering blocks are designed to develop your child's social skills from an early age. Encourages children to work together as a team to build awesome creations and comes with two dual-purpose ‘clicking' wrenches to help support interactive play. Invest in a toy that helps with your child's development! 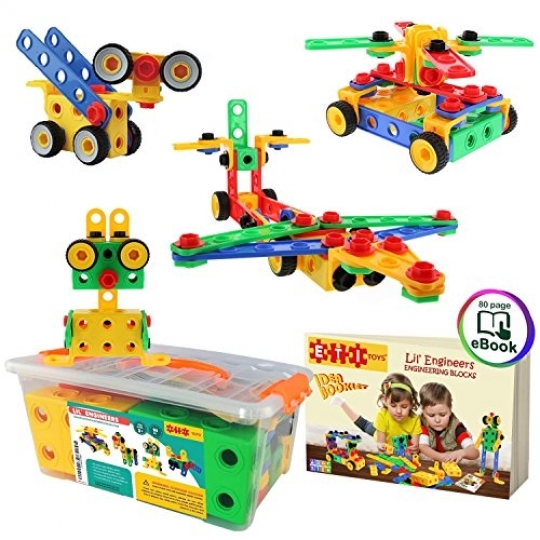 Are you looking for the perfect gift that your special Lil' Engineer will love to play with time and time again? Our customers tell us that Construction Engineering Blocks is the perfect gift for any occasion. ► YOUR CHILD'S SAFETY IS PARAMOUNT TO US. All ETI Toys® products are rigorously and Independently Third-Party Lab Tested. Certified Non-Toxic our Engineering Learning Set is BPA-Free, Lead-Free and Phthalates-Free. They also come with a 100% Money Back Guarantee. ETI Toys is the Original Seller, so please beware of imitation knockoffs. Your child's safety may not be as important to counterfeit sellers.